Everywhere I go I hear the same refrain: How do I find time to write? When I'm on a book project, every moment I can squeak in counts. At times, I rebel and take a mental health day or work on my neglected chores. My latest WIP is coming down the home stretch. It will need editing and the keen eyes of my critique partners and early readers. From there, it gets shipped off to my agent. Do I get to rest after that? Umm, no. 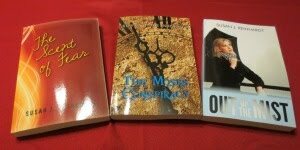 Out of the Mist, the third book of The Moses Trilogy, needs another read through and some tweaking. My other books are being prepared for re-issue, and the launch will require a great deal of work. The second book in the new series is hopping up and down in my head as we speak. So, another novel is on the horizon and ready to gallop into my life. Most of the current book was written in the evening. 1,000 words takes about two hours to produce. That time of day is not my optimum writing time, but I couldn't figure out a way to fit it in during the morning. To complicate matters, the Lord's been on my case to spend more time with Him when I get up. Although I talk with him during the day, those uninterrupted moments were too short. He definitely has first dibs on my mornings. 7:00 A.M. - 7:30 A.M. - Write! Bedtime comes earlier - 9:30 P.M. - or I can't get up at 5:00 A.M. Being able to write when I'm the most refreshed and alert has increased my productivity and quality. I can knock out 300-400 words in a half hour. The remaining word count is finished in the evening. It's such a boost to have that much completed before my day officially begins. I can even get a few things done and maybe relax. Writers: When is your best time to write? Please share how you manage to get your word count in for the day? Readers: What does your daily schedule look like? Do you get up extra early to accomplish something before the daily race begins? I can't write at night as I'm too tired. So my best time in in the morning any time after 8 and then maybe after lunch again. Today my day got shot to pieces but looking for tomorrow. You do great squeezing all that in! I need to get back to a set writing schedule. I usually am more alert in the mornings. Hubby can't sleep at night, so he seems to keep me awake a lot on nights. Or I have times when I can't sleep until the wee hours. sometimes, I am up anywher from 4:00 on and then wear out during the afternoon. When I usually get up at 7:00, My devotions, prayer, and Bible reading come first. Part of my devotional time is journaling. Then I may get on my NEO and write. Later, I load my writing into my computer. On certain days I am gone to a prayer group on Tuesdays, and every other Wednesday morning, I do visitation with another lady from church. Hi Terri - Night isn't my optimum time, but I often have no choice. Like you, I'm more productive in the morning. Right now, I'm taking a break. Hi Mark - Thanks so much for stopping by and commenting! Your schedule makes mine tame by comparison. It's a wonder you get any writing done. Suggestion: What if you inserted a note in your manuscript to fix/amplify on an area giving you problems? Then you can tackle it in the editing phase. I did that with my latest book, and it worked really well. Like you, my devotional/prayer/Bible reading are first. Sleep deprivation does make keeping a schedule hard.